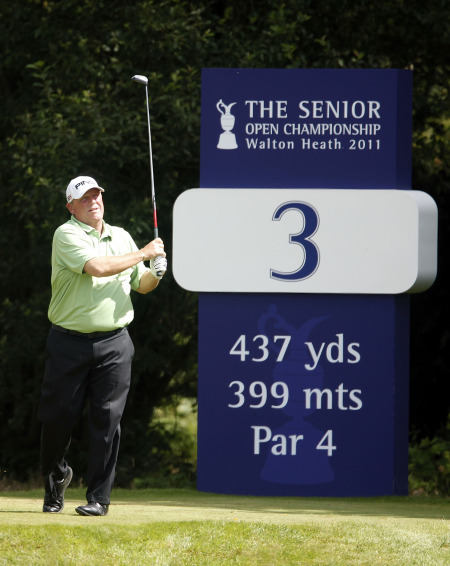 South African John Bland looks set to shake off his Senior British Open hoodoo. Three times a runner-up in the past four editions of the championship, the big man from Johannesburg looks to have the steely determination to win the title at last. 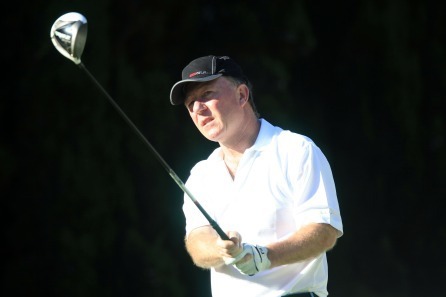 Yesterday he shot a solid opening 68, three under par, to share the lead with playing partner Denis Durnian. Bland has finished second in this event in his last three appearances (1997, 1999, 2000) after missing out in 1998 because of the death of his wife, but yesterday he kick-started his challenge with a solid round that included and eagle, two birdies and just one bogey. Enjoying the best of the conditions with only a slight breeze caressing the links, Bland and Durnian finished just one shot ahead of a group of five on two under par - former Senior British Open champions Bob Charles and Brian Huggett, Welshman John Morgan, Scot Bernard Gallacher and Japan's Noboru Sugai. And he even found time to joke at he expense of reigning champion Christy O'Connor Jnr, who is unable to defend his title after breaking his leg last April. "I've played three times and been second three times, Christy beat me the last two years so I broke his foot this year and took care of him," he joked. On a serious note he added: "Unfortunately Christy is not here this year. It's always nice to come back somewhere you have played well and we just hope Christy gets better soon and will be back. It's a shame he couldn't defend." Of the Big Three, Jack Nicklaus' is nicely placed after his one under par 70, while Gary Player is still not out of it after braving the worst of the wind to card a one over 72 that included an eagle three at the first. The nine-time major champion hit a six iron to five feet for his opening eagle but then handed his shots straight back with a double bogey at he fifth where he had to come out the fairway bunker backwards and missed the green with his third. The South African said: "I didn't play well for the first nine holes and all of a sudden I just found something and played my first decent eight holes. I am still very athletic and I'm going to win a lot of golf tournaments still." But there was no magic from Arnold Palmer, now 71 years of age, who crashed to a disasterous 84 in his very first round at the famous links. The King said: "It's difficult to come to a strange golf course you have never played before and in one day pick up everything you have to do. That was very remiss of me to even try to do it. "I enjoyed today and I enjoyed the golf course but I didn't enjoy my golf. It hurts to play badly. It's terrible and that's what will eventually run me off the golf course. But the crowd was great." But there were no such problems for Bland. Despite dropping his only shot of the day at the testing finishing hole, the rugby-loving South African was delighted to be back in the frame at a Senior Major After an eagle at the first, where he holed from 30 feet, Bland picked up two more shots in spectacular style on his way to the turn. "Hit it to six inches o the seventh with a nine iron both Denis and I nearly holed in one and then hit another nine iron to six inches on the ninth," he said. "Then all pars on the back nine until the last where I drove it in the rough and just missed from five feet for par. "But it's wonderful to see Jack, Arnie, Gary, Bob Charles, Jacklin, Dave Stockton is another major champion. It's good to see more American's coming over. It's beginning to get bigger and bigger. Great to see the Big Three here." Durnian was two over par after five holes but bounced back brilliantly thanks to birdies at the seventh, tenth, 11th, 16th and 18th. He said: "Winning the Welsh Seniors Open kick started my season and I haven't looked back since. I can now play knowing that I don't owe anyone any money and I'm a lot more confident." Ballyliffin’s Old Links was the real winner as just five players broke par in the opening round of the Irish Seniors Open. Eduardo Romero’s affinity for The Senior Open Championship continued as the Argentine took a share of the lead with America’s Bruce Vaughan at Royal Troon after the pair left Greg Norman in their wake. American Mark Calcavecchia (©Getty Images)Des Smyth missed the cut but Mark Calcavecchia’s bid to become only the fourth player to claim an Open Championship-Senior Open double continued at Walton Heath where he shares the halfway lead with his compatriot Lee Rinker and Canadian Rod Spittle on seven under par. Former Zimbabwe great Mark McNulty (76 for level par), Denis O’Sullivan (74 for three over) and Eamonn Darcy (72 for four over) were the only Irishmen to make the last two rounds with Smyth missing out by a shot after a 74 left him on five over. Philip Walton was pleased to shoot 69 on his European Senior Tour debut in Mallorca. Picture ©Getty ImagesPhilip Walton made an impressive start to his Senior Tour career when he opened with a two under par 69 to lie just one shot off the lead in the Mallorca Open Senior Open. 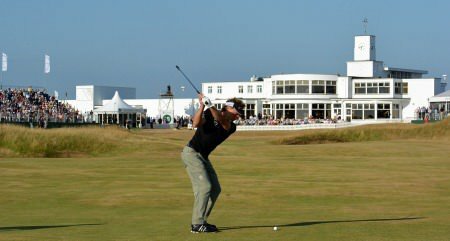 Bernhard Langer © Getty ImagesMark McNulty might be just two shots off the lead but Des Smyth and Philip Walton were the only others survivors after two rounds of he Senior Open Championship Presented by Rolex at Royal Birkdale.